Earlier this spring I posted some new photos taken in Jeddo and Swamptown, courtesy of Thomas Sessock, Jr. 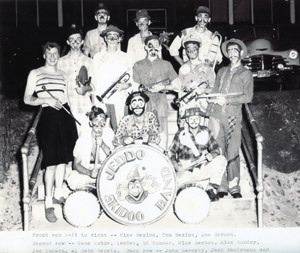 They included this one of the Jeddo Skidoo Band, taken in the late 1940s or early 1950s, with names of most of the people in the photo shown at bottom of the image. 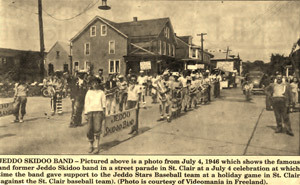 A month later Tom Bezick, former Jeddo Skidoo Band member, sent this note: "Just read an article about history of Freeland and surrounding towns. 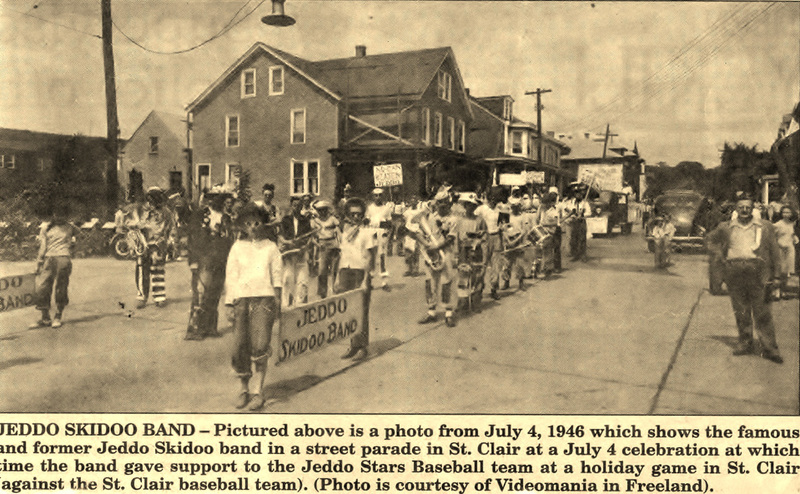 I was a member in the Skidoo band. 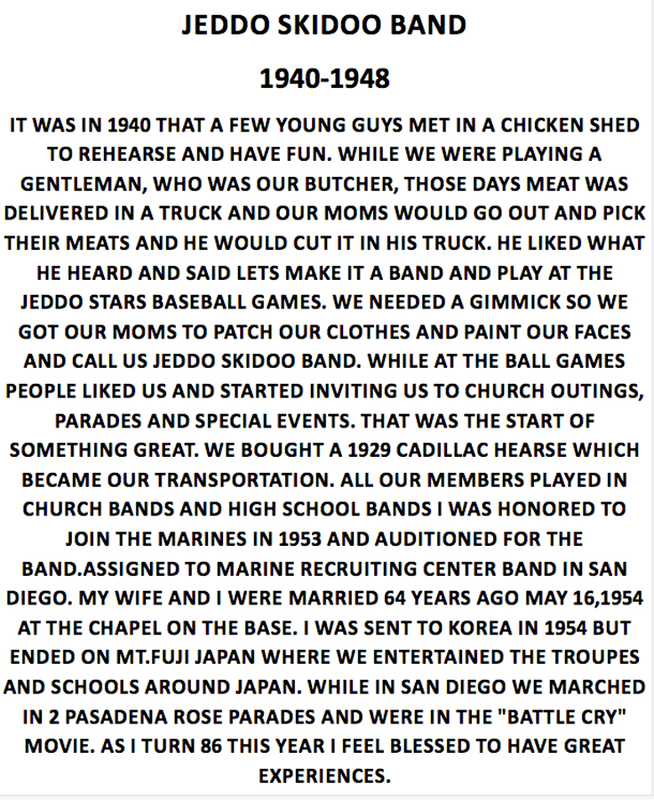 We started it in the early 40's and ended 1948. In the picture I am the one behind the drum. 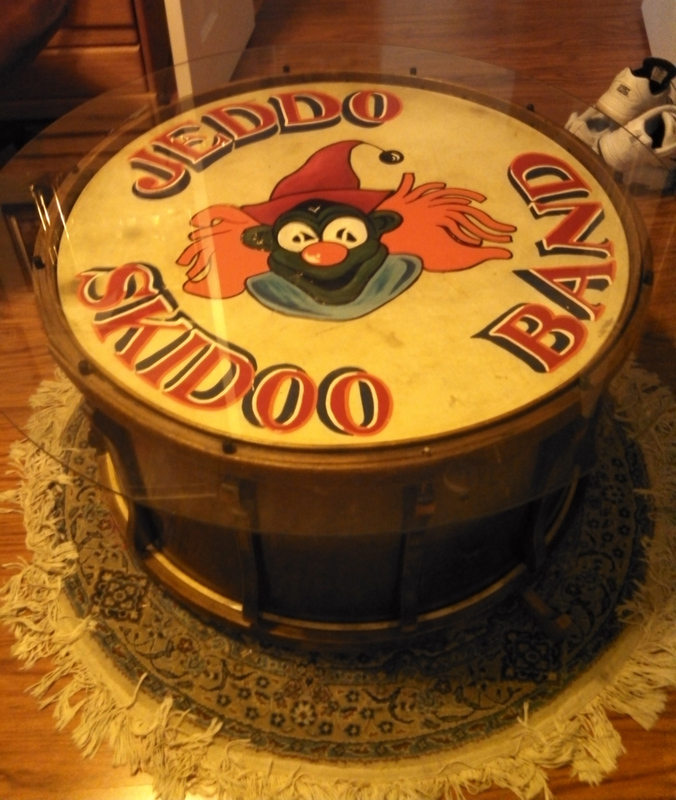 I still have the drum and use is as a coffee table here in California. There are 3 still alive. Graduated from Hazle Township HS 1950. Great memories as I still have family in Jeddo and Freeland. If you need more info on how we started please e-mail me." 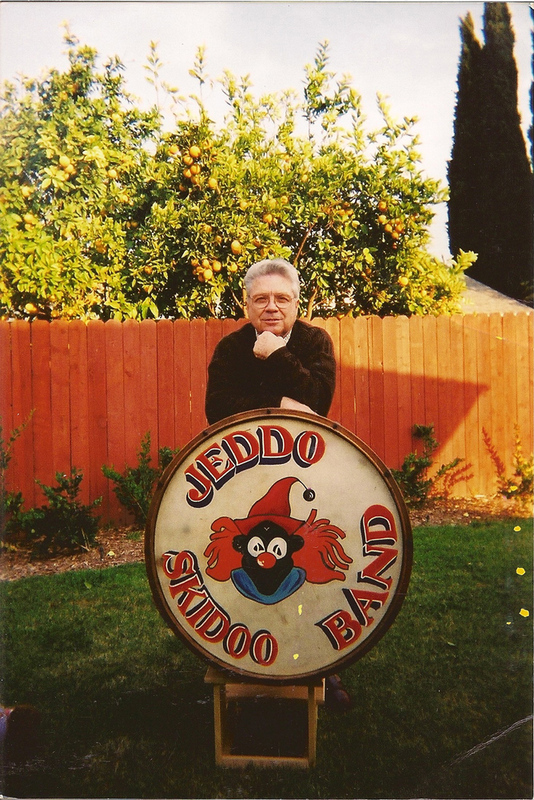 He added later: "When I left Jeddo in 1953 I entered the Marines and was selected for the band. This was the highlite of my life." 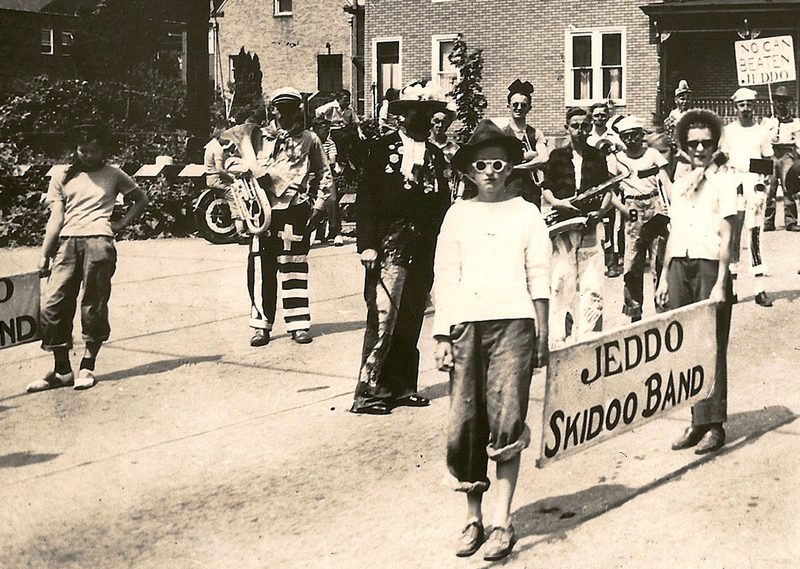 What a happy group these Skidoo members made! Tom says this is the first photo of the band. 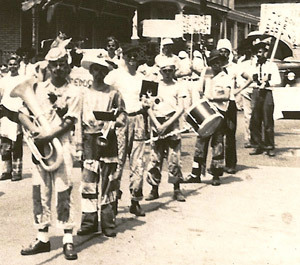 The band leader and local butcher is at left, face painted, dressed in a baseball uniform. Tom wrote: "His idea to take us to the events. Went to Sampson Naval Base with Jeddo Stars. Did a parade at Lafayette college. Most events were at Church parties and parades. … I am second on his left with the big horn." This is another copy of the photo that was previously shared by Thomas Sessock, Jr. Tom has written on it: "Last picture taken 1949. 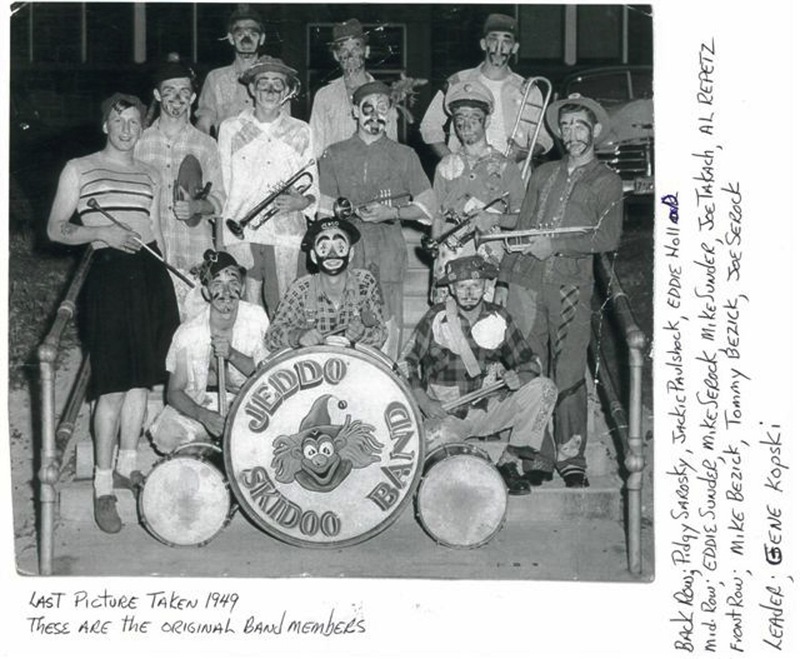 These are the original band members." Tom says there are 3 of them still alive. Back row: Pidgy Sarosky, Jackie Paulshock, Eddie Hall. 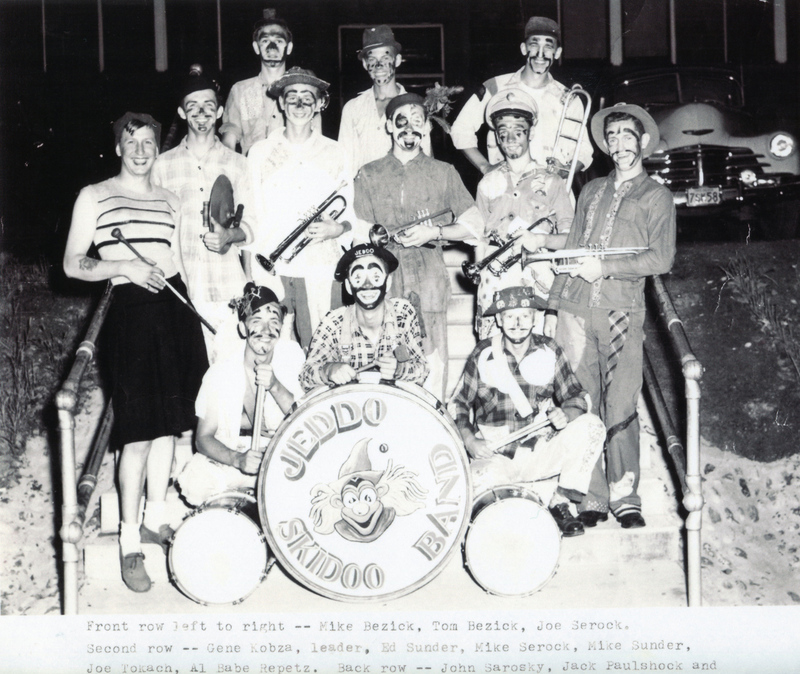 Middle row: Eddie Sunder, Mike Serock, Mick Sunder, Joe Takach, Al Repetz. 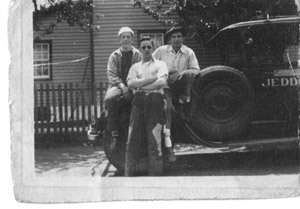 Front row: Mick Bezick, Tommy Bezick, Joe Serock. 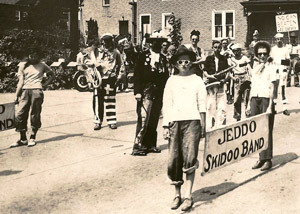 Leader: Gene Kopski (at far left, costumed in a skirt); his brother was the band's bus driver. This must be the 1929 Cadillac hearse that Tom said they purchased as their Jeddo Skidoo Band bus. Tom Bezick with the Jeddo Skidoo Band drum. He wrote: "I still have the drum and use it as a coffee table here in California." 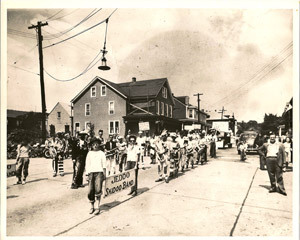 Tom graduated from Hazle Township in 1950. He went to St Marys Greek Catholic church, and worked at United Wallpaper and Boston hardware paint stores. 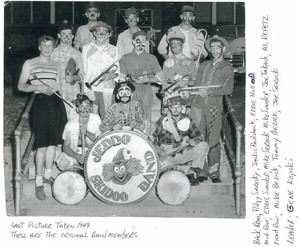 He not only played in the Jeddo Skiddoo Band, but he also played in St John's band. 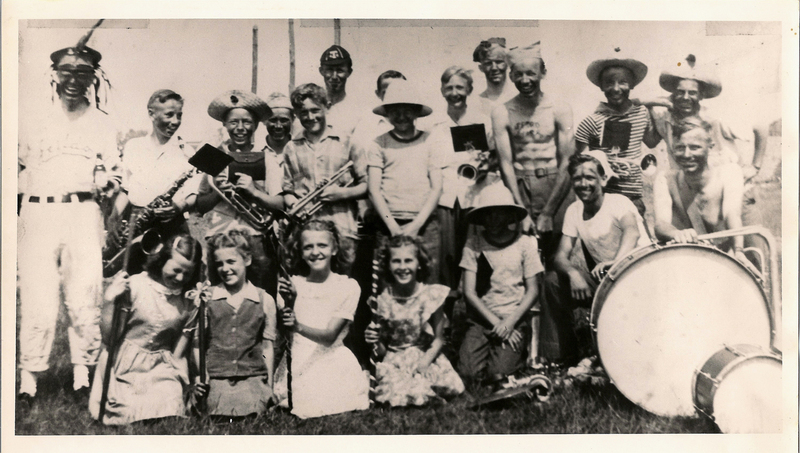 After joining the marines in 1953 Tom played in the Marine Recruiting Center Band. 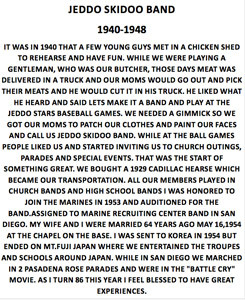 And music apparently ran in the family, because his brother Chickie Bezick had a famous Polka band: the Fall Guys, or Chickie and the Polka Dots. Tom, thank you for sharing your memories and photos with us!